Early voting has begun in Ohio. And the Obama campaign is turning out Democrat voters by the busload. They want to "bank" enough early votes now that they'll have won Ohio and the election before Election Day. Because if Obama wins Ohio, it's game over. But there is a way to stop Obama. And I need your help to do it. My name is Josh Mandel and I am the Republican nominee for U.S. Senate in Ohio. I'm in the fight of my life against Obama's close ally, Sherrod Brown. Brown has supported Obama's agenda 95% of the time, so it's no surprise that Obama and Brown are working hand in hand to turn out the vote in Ohio. 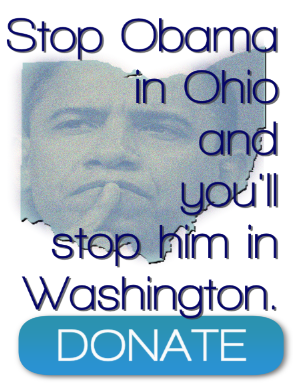 I need conservatives like you to stand with me and stop the Obama-Brown machine in Ohio. First, a Marine never retreats. We hold our ground. And today that ground is Ohio. Second, Washington has a spending problem that won't be fixed unless we defeat Obama and take back the U.S. Senate by sending Brown into early retirement. Sherrod Brown has been a thorn in the side of conservatives for too long. He was the key 60th vote for ObamaCare. He's voted 189 times to raise taxes. And he even went on the floor of the U.S. Senate to call opponents of union reform "Nazis." Not only has Sherrod Brown been named the "Most Liberal" senator in America, he's what's wrong with Washington. Ohio voters have soured on Brown. But we still have to do the hard work of getting out the vote to beat him. Turning out Republican voters to defeat Brown will deliver a knock out blow to Obama's chances of winning Ohio. I need your help immediately. Click here to join the fight. The Obama-Brown machine is turning out record numbers of voters in the Democrat strongholds of Cleveland, Cincinnati, Toledo, and Columbus as I write this. They are banking tens of thousands of votes. To stop them from building an insurmountable lead, I need patriotic Americans who love this country to stand shoulder to shoulder with this Marine. Stand with me today. Your donation today will be used to get our voters to the polls today. Everything hinges on Ohio -- both the U.S. Senate and the White House. With your help, I can beat both Sherrod Brown and Barack Obama here. And when I go to Washington, I will lead the fight to bury the Obama-Brown legacy of bloated government and binge spending.